How Do We Know Who the Top Organic Retailers Are? Unfortunately, very few public organizations track organic retailers or organic retail sale specifics. There's very little organic organic market research available. Even top organizations such as the USDA Organic Program and the Organic Trade Association (OTA) don't track organic retailers or sales. Without proper market research available, it's difficult for organic retailers to make top-notch business decisions. Based on information from various organic organizations and private market research companies, we can piece together two key facts about the organic retailers and consumers. These facts allow us to estimate who the top organic retailers are. Non-food organics, including supplements, personal care products, household products and cleaners, pet food, flowers and fiber products, in total, saw a 9.1% growth rate in 2009. However, organic food is the best selling segment of organic products. 2009 organic food sales commanded 93% of all organic products sold, totaling $22.9 billion in sales. 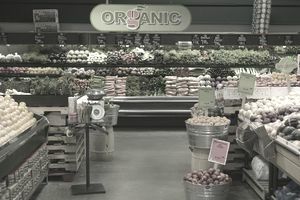 In the past consumers mainly shopped for organic food at independent natural and organic grocers, food cooperatives and large organic retailers such as Whole Foods Market. The OTA, the National Grocers Association and the USDA note that the lion's share of organic food sales now occur at mainstream grocery stores. In fact, the Food Marketing Institute says that organic food is now available in 82% of mainstream supermarkets. Organic food, sold at mainstream stores, is currently the most successful organic retail product. We can assume that the top organic retailers are large, profitable grocery chains that carry a decent selection of organic food.